If you’re just learning to crochet, this is the pattern for you. 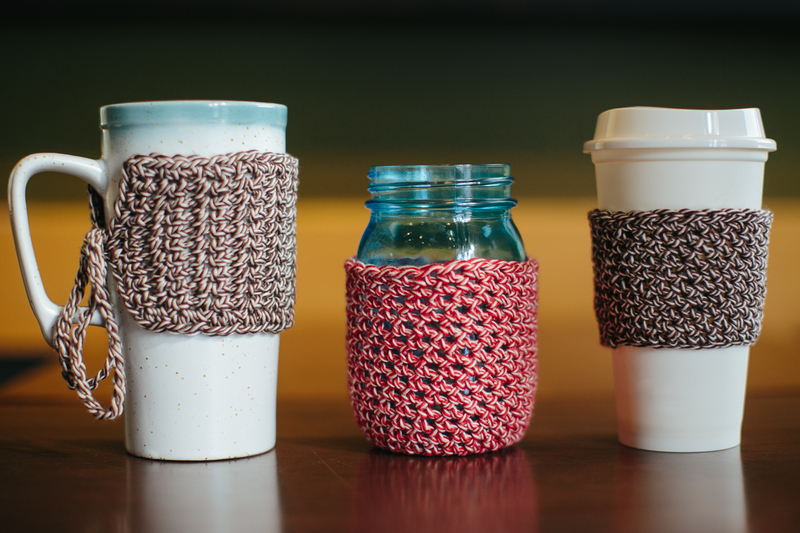 It is very simple and quick to create and the final product is a practical way to keep your drinks hot and your hands comfortable. This makes a darling gift for coffee and tea drinkers and is an earth friendly reusable alternative to a cardboard drink sleeve. I just found out I cannot attend the class on May 17th for the nesting bowls. I have paid for the class and bought the pattern on line as I am very excited to learn them. Can we set up a time to meet and I can learn the bowls ? I was in your rug class and finished it well. I think I can do the bowls but would like to make sure I have any guidance I may need. Are there other yarns you recommend besides the sari silk? If so what would it be and what size of hook would I need? Please let me know your thoughts or ideas on this. That’s so sad! It would have been fun to see you again. I can do a private lesson May 3rd & 10th from noon – 1 pm. Let me know if that works for you. You can choose any bulky or super bulky yarn. You want the bowls to be stiff so use a smaller hook. We can choose yarn when we get together too so we can get the right hook size.